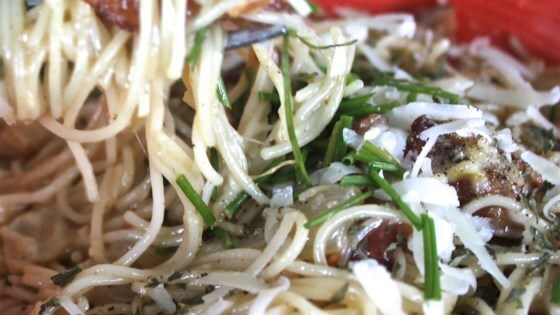 "A cheesy creamy sauce for spaghetti with bacon and mushrooms." In a large skillet over medium heat, fry bacon until crisp and drain on paper towels; crumble and set aside. Bring a large pot of lightly salted water to a boil. Add pasta and cook for 8 to 10 minutes or until al dente; drain and add to cooked mushrooms. Meanwhile, saute mushrooms in about 1 tablespoon of bacon drippings and remove from heat. Add the cheese cubes and beaten eggs; toss until the cheese is melted and the eggs have coated the noodles. Sprinkle in the crumbled bacon and stir; serve. I didn't use mushrooms, cause I don't like them, but it was Pretty good, a little heavy and sticky. added green pepper and onion for a little extra flavor. Very satisfying.